In Felt to Stitch, acclaimed feltmaker Sheila Smith explores the possibilities of making and using handmade felt for stitch. Felt is an incredibly versatile medium that is easy to make and manipulate and provides the ideal base for surface embellishment. Handmade felt allows you a degree of control and creativity that ready-made fabrics cannot replicate. This book shows you how to make your own felt, select and dye your own colours, build unusual textures with felt fibres and further embellishment, and manipulate the felt to produce three-dimensional pieces. 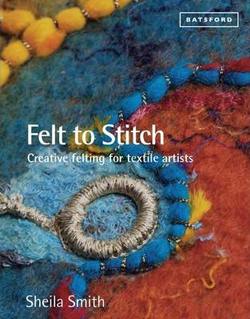 With sample projects that illustrate the main techniques, Felt to Stitch addresses the main elements of design in felt; colour, line and shape, texture, and more techniques, this is an essential book in the library of any textile artist.